It’s a guy thing. Moving from vehicle to vehicle as a statement. Jake, like Feral, gravitates to unusual vehicles. I doubt he’ll ever drive a Ford. I never know what he’ll show up with at trout camp but I am often inspired to take a photo. For a while he was on a VW mode and that was entertaining. 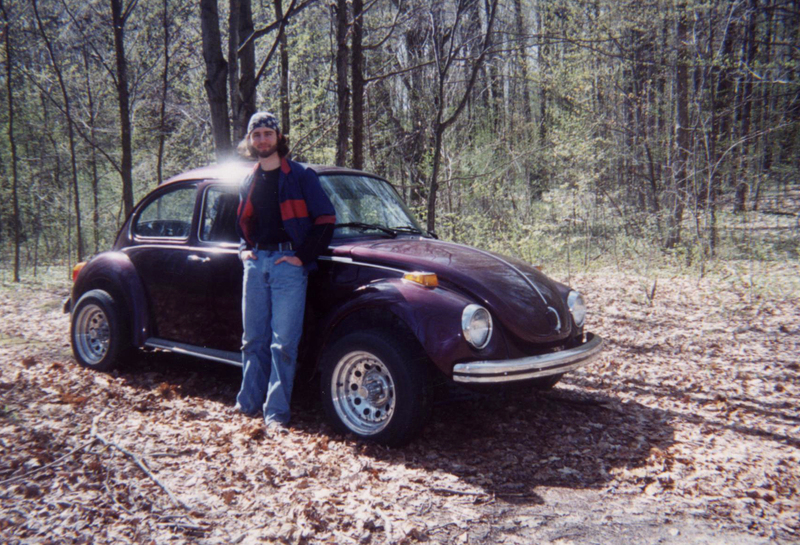 The bug was cool though I seem to recall packing a guitar and camping and fishing gear was an exercise in physics or at least bending atoms. We insist on a guitar since he does some very interesting finger picking including some Chet Atkins. He also plays bass and one time he showed up with a stand-up bass packed into the rear end of a GEO tracker. Another exercise in physics. 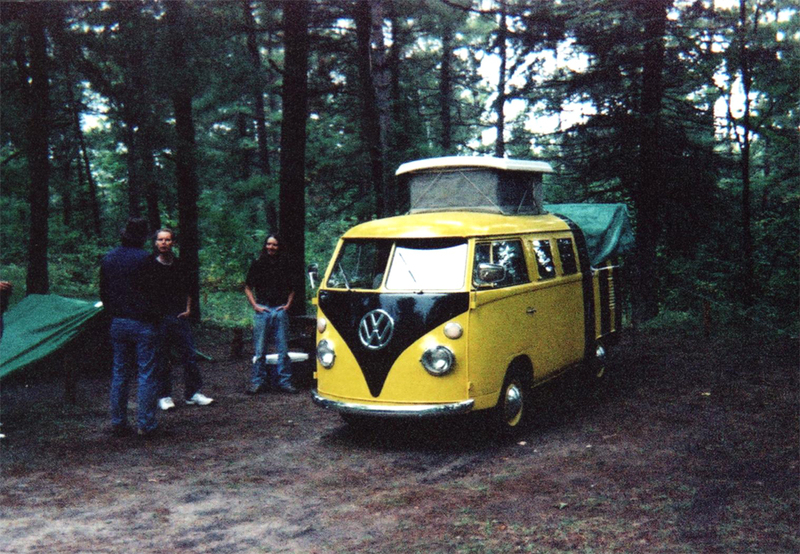 Jake pulled into fall trout camp with the above VW camper van several years ago and that drew a crowd. I believe the pop top allowed a person to stand up inside though you couldn’t walk very far. Also, there were some clever mechanics that positioned a cot near the ceiling. I wish I would have taken more pictures because it really was a classic. He sold that and that seems to be the way with him and Feral. Life is too short to keep driving the same thing for very long. This year Jake showed up with a new Jeep which is a little surprising because Feral, his dad, has a history with Jeeps and many Jeep repair stories. 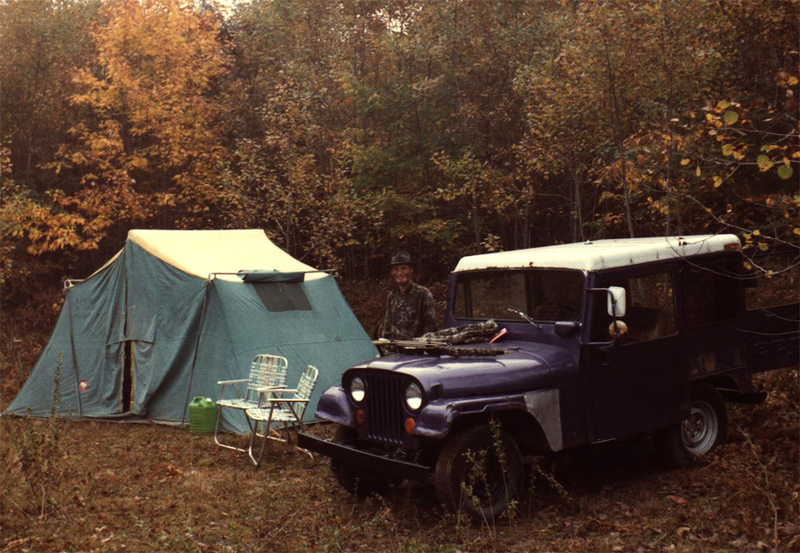 Below is a photo of Feral back in the seventies ready for bow hunting, something we keep talking about because in Michigan the second that trout season ends – bow hunting begins. So that would be an excuse not to break camp and head home. I’m not interested in harvesting a deer, but the woods are spectacular in October. 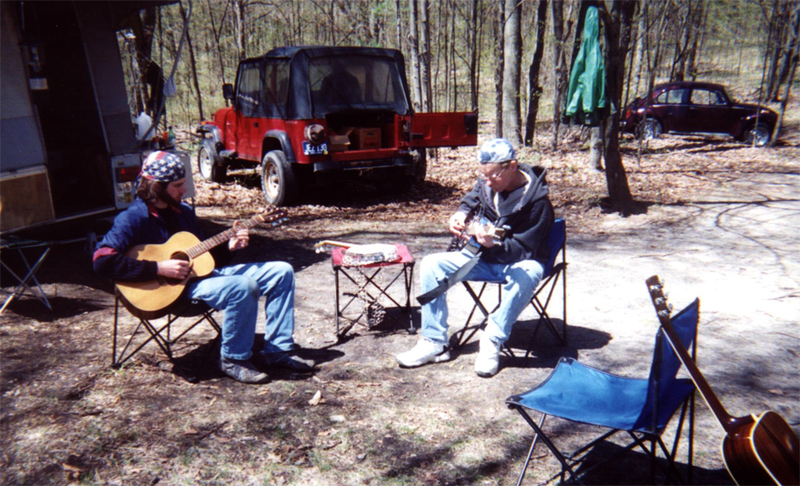 Here is another Feral Jeep with some guitar jamming in the foreground. Feral had good luck with this Jeep and drove it for a while – at least a year and maybe longer. Jake is finger picking a classical guitar, Feral is playing a Dobro, and that’s a 1970 Martin D-35 in the foreground which I sold. Guitars are like cars: Life is too short to keep playing the same one your whole life. Going back to Jeeps, check out the one Natch brought to trout camp a couple years ago on the post about Pickerel Lake. Natch drove us down a treacherous trail to the to the Sturgeon River that still makes me smile. Deep ruts and odd angles. Jeeps are good for that – going where no man has gone before. Something Feral did with the Dobro.